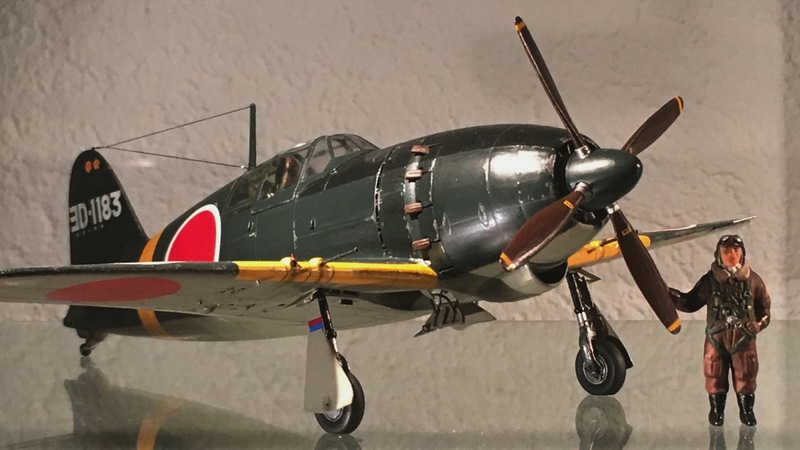 Michael Thurow has kindly contributed another article describing the rejuvenation of his original Raiden model built from the 1/48 Tamiya kit in 1977. 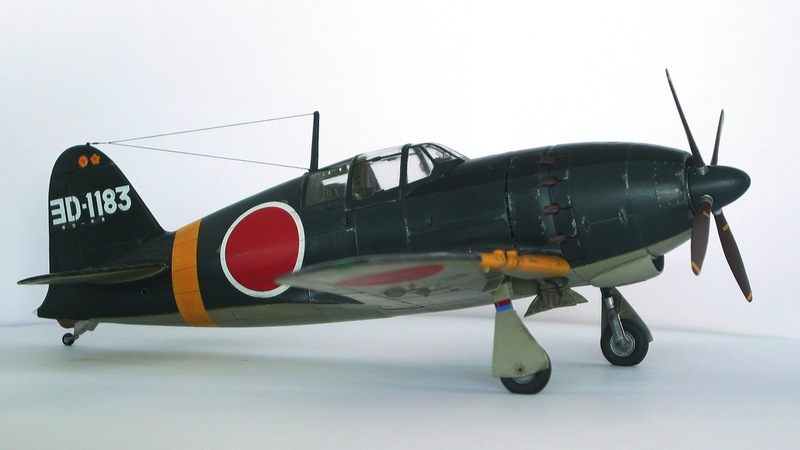 The Mitsubishi Reisen or the Nakajima fighters may be more typical of Japan's WWII fighter technology, but for me the truly Japanese combat aircraft are the Army's Ki-61 Hien and the Raiden. It must have been Revell's exciting box art of the sixties which as a boy inspired my lasting affection for these two airplanes. So they were among the first models that I built in 1/72 (Hien) and 1/32 (Raiden) scales. Naturally the Raiden was also one of the first when I started my 1/48 collection ten years later. At that time only the Tamiya kit was available. "Only" should be the wrong word since it is a superb model. On the outside - dimensions, shape, fit, panel lines - all look perfect. Even cockpit and details are still competitive by today's standards although a lot can be improved with the latest aftermarket items as we will see. My 1977 model was built out of the box except for an open cockpit and extended flaps. I used the old Humbrol N1 which came very close to "IJNAF green" when I mixed it with the early Humbrol gloss varnish that tended to yellow strongly (see picture below), while for the underside I choose a much too whitish grey. 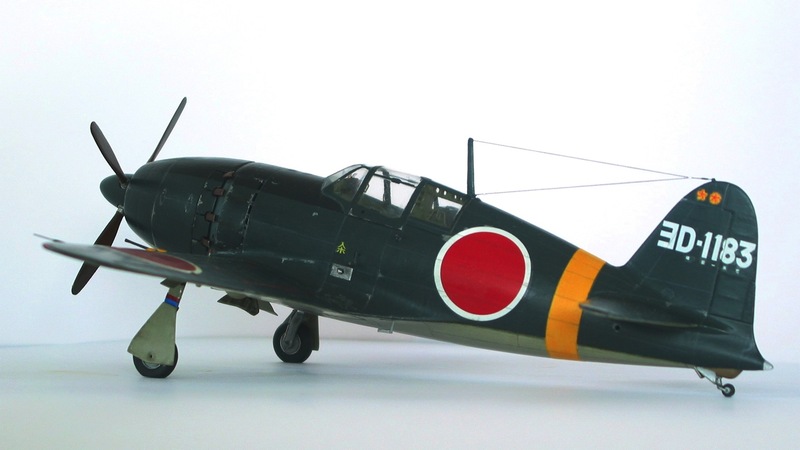 The model represented ƎD-1195 of the 302nd Kokutai, allegedly Sadaaki Akamatsu's mount. 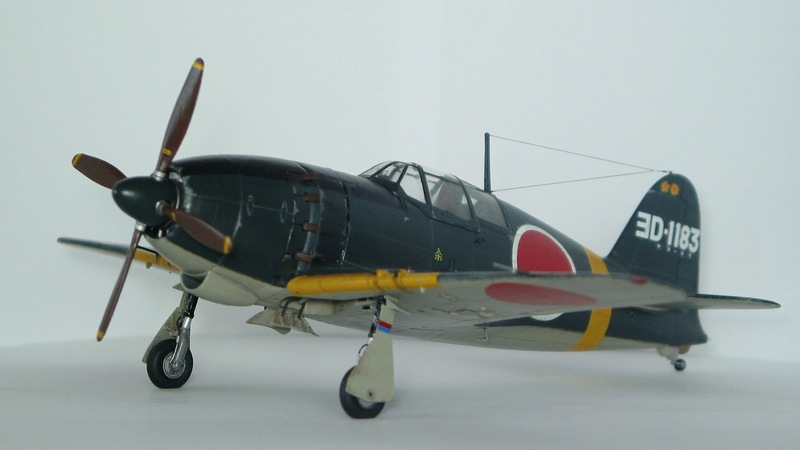 This is the history of the model that I recently disassembled and restored. To inspire my Raiden with a second life I focused on the weak spots: cockpit, engine compartment and undercarriage. Let's begin with the front section which challenged my abilities the most. First, I cut the cowl from the main fuselage. This had to be done with care because it is not a natural separation line on the kit. I drilled and sanded off the remains of the molded exhausts, sliced the cooling flaps in order to bend them slightly inward (a typical feature of Raiden flaps when closed), and scraped the front ring of the open fuselage to a sloping profile. Opening the air slots behind the cowling was a delicate job. I used a Dremel saw but more damage was done than I had expected. I spent several hours correcting the slots and inserting the small access panel connectors. Adding new exhausts (Quickboost # 48383) and re-attaching the front section was easier. 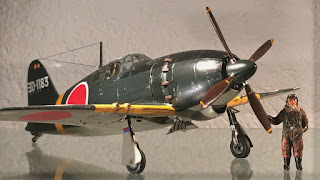 The next hurdle was finding a solution for the prop attachment because - disregarded by Tamiya - the aircraft has a fixed ring between propeller and rotating cooling fan. How to fabricate and, particularly, how to fix this with any stability? Groping through all kinds of scrap and metal parts that a household offers I was finally lucky to find an iron separation ring as used between a screw and a nut that possessed exactly the diameter needed. I backed it with a piece of cardboard of equal size in which I fixed two metal pins at the 6 and 9 o'clock positions as on the real plane. These connected to holes drilled opposite in the inner cowling ring. It held fast as hoped and the propeller shaft would pass through to the fan centre. One more separation ring served as a new back plate for the Tamiya propeller. Next came the cockpit. There are two excellent aftermarket items: the Aires cockpit set # 4538 and the Eduard detail set # 48201. I used both and, although meant for the Hasegawa kit, they fit perfectly inside the fuselage after I had cleaned the walls of the molded detail. Not available was a type 96 transmitter which sits quite prominently behind the pilot's headrest. Nevertheless I removed the kit's insufficient "block" from the rear decking to upgrade this area. I finally found a suitable radio in the scrap box and with some detailing, painting and decals it looks realistic enough. As can be seen I initially prepared supports for the armoured glass inside the wind screen, which I later shortened as my choice of plane didn't have this feature (see text below). With some regret I decided to hide the wonderful cockpit under a closed canopy because too many of my models have open cockpits and the Raiden looks much "faster" with the hood closed. I took the one from the Falcon 33 IJNAF canopy set - the material is very stiff and hard to work on! (I prefer Squadron vacu parts) - and I made a mistake when I didn't separate the middle and rear sections. I hoped to save time - but no, it was a nightmare getting the unwieldy part to fit the fuselage. Finally I turned my attention to the undercarriage. Everything was enhanced to create a more authentic appearance: The wheel wells received fake access holes and rounded stringers, the original undercarriage legs (no aftermarket item available) were brought into shape and brake lines added, the wheel covers came from Quickboost (# 48399 - hard to remove from the resin block without cracking the thin parts!). I didn't use the True Details tires which I had bought because they were too wide to fit between gear and door, hence the Tamiya wheels got a second chance. During final assembly I added a few additional improvements like an overhauled oil cooler and new Air Master # 48-021 metal gun barrels. I favour planes for which photos exist. Thus ƎD-1195 was no longer an option, but I wanted to keep the Yokosuka Kokutai history and after some deliberation choose ƎD-1183. Pictures of this aircraft are shown in FAOW No.61 on p.28 (below), p.69 and (probably) p.10. 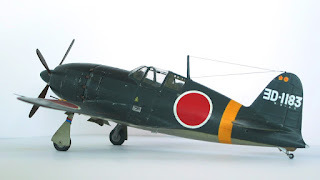 Its pilot may have been 1st Buntai leader Tai-i (LT) Junro Teramura (Osprey Aces 129) and it was possibly shot down by Major James Trapp, CO of the 78th FS while flown by Chu-i (LTjg) Ei Fukuda on 19 April 1945 (FAOW). A nice extra feature of this aircraft is that it was one of the few equipped with an oblique firing 20mm Type 99 cannon fitted to the port side below the cockpit. With some care a hole can be drilled at the correct angle with a thin paper rectangle simulating the blast protection. 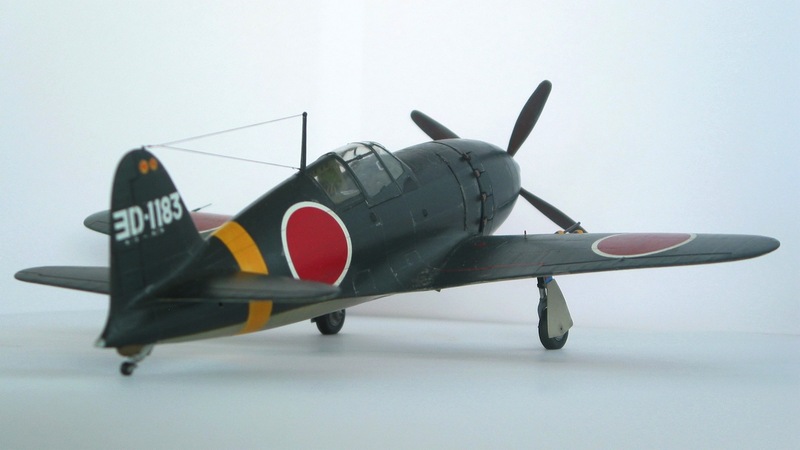 The Tamiya kit contains only the thin propeller... just a joke! 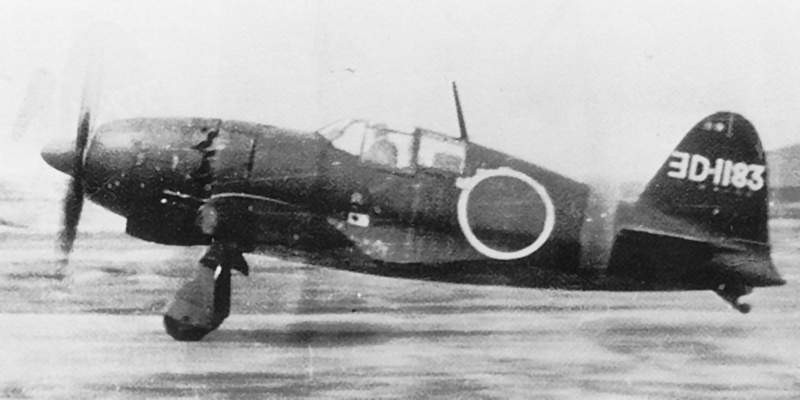 The side gun equipped Raidens were modified from early batches in late summer 1944 (some still were J2M2s). By the time the broad props appeared the oblique-firing concept had proven unsuccessful. The picture on p.10 of FAOW most likely shows ƎD-1183. The propeller is not visible but the plane next to it - also with side gun - has the early prop. I measured the width of the rotating blades on the photo above against both variants on other pictures with approximately the same perspective. It appeared closer to the early propeller than the late one. There is no clear evidence of a protruding gun barrel (perhaps or perhaps not). It seems the additional gun sight in the upper left corner of the windscreen, which appears installed on FAOW p.10, has been removed. No gunsight = no gun!? (The location of this gun sight inhibited installation of the armoured glass - as mentioned - which is seen missing in the photo; another reason was weight). The oblique cannons had little effect and were later removed, also to save weight which was critical to reach B-29 combat altitudes. Concluding my report I'd like to thank Nick for his excellent Raiden Colour Notes that I received just in time to guide my painting of the model. For the topside D2 Green Black Colour I mixed old Humbrol N1, of which I still had an unused tin, and Humbrol 195 "satin green". The J3 Grey undersides are painted with Humbrol 40 toned down with a strong touch of rust brown. Some PC screens may not exactly represent the original colours of my model. I experienced several different hues of green which strongly reminded me of Nick's message about correct colour interpretation! Beautiful work, a labor of love making an already nice kit even better. Wow. Fantastic even down to the luster. Very nice work, Michael. Thanks for sharing. Thank you for your kind comments, gentlemen. My next one, a D4Y3, is nearing completion.